Western True Crime #15: Golden Age Western-Frontier Comic 1948 - True Stories of the Wild West! Western True Crime #16: Golden Age Western-Frontier Comic 1948 - True Stories of the Wild West! 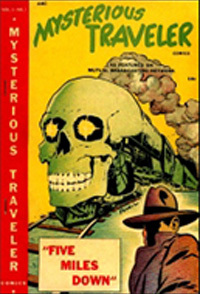 Authored by Kari A Therrian, Authored by Fox Feature Syndicate Inc.
Western True Crime #3: Golden Age Western-Frontier Comic 1948 - True Stories of the Wild West! Western True Crime #4: Golden Age Western-Frontier Comic 1949 - True Stories of the Wild West! Western True Crime #5: Golden Age Western-Frontier Comic 1949 - True Stories of the Wild West! Western True Crime #6: Golden Age Western-Frontier Comic 1949 - True Stories of the Wild West!